Green Onions (also known as scallions) have a long green stem with a small white bulb. 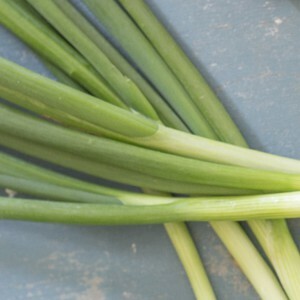 Green Onions (also known as scallions) have a long green stem with a small white bulb. They have a mild onion flavor that is concentrated in the bulb. They can be used raw or cooked. Some cooks discard the darker green tops, but the whole stem can be eaten and is often used in Asian cooking.